PARIS — The French Navy sees no problem with a prospective sale of the Normandie multimission frigate to Egypt, and in return has asked that sister ships be delivered more quickly so it has six of the new warships delivered by 2018, Navy Chief of Staff Adm. Bernard Rogel said. The Normandie, a 6,000-ton frigate or frégate multimission (FREMM) built by DCNS, is a key asset in an export package worth €5 billion-€6 billion (US $5.7 billion-$6.8 billion) under negotiation with Egypt. But if the frigate does sail away under the Egyptian flag and if the French Navy does receive the sister ships under the requested schedule, the French government is likely to come under further budgetary strain. "Just for now it's not a done deal," Rogel said Monday Feb. 8 when asked about the talks with Egypt. "Everyone is talking about it, so it's no secret that today we are working on a request from Egypt, the purchase of a multimission frigate with a very quick delivery, for the summer 2015," he told the defense journalists association. Last summer, Egypt ordered four Gowind corvettes last summer worth around €1 billion, with options for two more. Cairo is undergoing a "deep renewal" of capability, Rogel said. The Navy has set conditions on handing over the Normandie, namely extending the life of one of the present frigates, and the shipbuilder delivering a total six of the new multimission warships by 2018, he said. "We have checked, we can extend one of our frigates," he said. That ship would be the Montcalm, an F70 anti-submarine frigate of the Georges Leygues class, based in Toulon, southern France, and due to be decommissioned this year. "And the second condition is that there should not be an overall impact on the Navy, which is already very extended," he said. "The shipbuilder must be able to guarantee we will have four FREMM frigates by 2016 and six FREMM frigates by 2018. I have been seriously told that could be done," he said. That would speed up delivery of the FREMM frigates to one ship every 12 months from 18 months set out in the present schedule, he said. "With those conditions, the Normandie can be sold," he said. After delivery, the Navy takes a further six to 12 months before the ship enters service, he said. The Navy expects to have 15 first-rank warships in its strategic plan for 2025, he said. That includes eight FREMM frigates and three planned intermediate frigates. The FREMM will comprise six anti-submarine and two air-defense versions, with the latter expected around 2021. The service would accept four of the eight FREMMs to be acquired with a lease agreement under the planned state-backed special purpose vehicle, he said. The two Horizon-class air defense frigates — the Forbin and Chevalier Paul — are also in that first rank fleet, he said. The five La Fayette-class frigates are "excellent" but no longer qualify as first rank. These 4,000-ton ships lack the anti-submarine warfare (ASW) and air defense for area protection needed to sail in a crisis zone. The La Fayette carries the Thales Crotale missile for anti-air self protection. Design studies will start next year for the three intermediate frigates, he said. The new ships will weigh in between 4,000 tons and 6,000 tons, and have a multimission capability with ASW and launchers for the MBDA Aster 15 and naval cruise missile. The intermediate frigates would also address the export markets, he said. The white paper for defense and national security noted that air defense is needed for naval operations close to a hostile coast, and anti-submarine systems are required because of a proliferation of submarines, he said. A faster domestic delivery of the FREMM frigate unwinds the slower schedule adopted by the government, which looked to ease an annual financial burden by stretching out the deliveries. That slower delivery rate would add the equivalent of the cost of one frigate to the budget, the then-DCNS chairman, Patrick Boissier, told the National Assembly parliamentary defense committee in 2013. All the eight FREMM frigates, including the air defense versions, will carry athe cruise missile launcher, Rogel said. The planned six Barracuda nuclear-powered attack submarines also will fire the cruise missile, so the service will have 14 platforms for the long-range weapon, he said. If three frigates and one of the Barracudas sailed off a hostile coast, they would be able to fire a salvo of more than 20 cruise missiles, he said. DCNS delivered the Provence, the first of class of the FREMMs, and Languedoc, the third ship, is due for delivery in 2016. The Navy last year extended a lease of the l'Adroit to continue sailing the offshore patrol vessel this year, Rogel said. 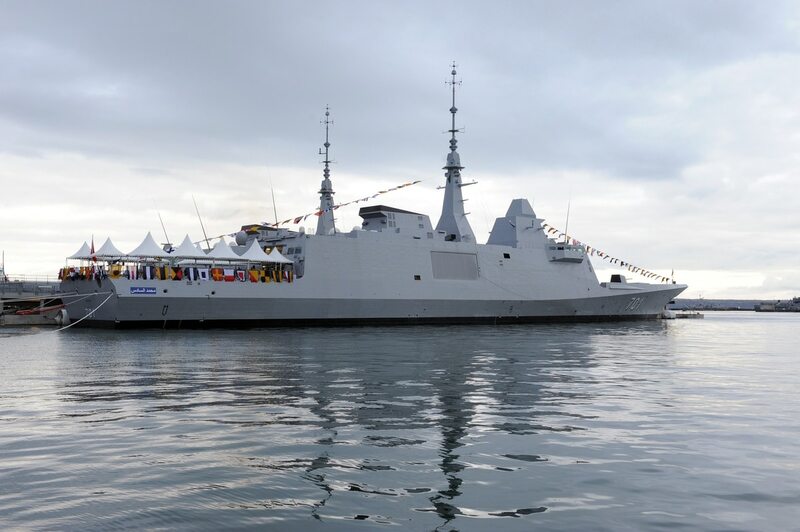 The OPV, flying the French Navy flag, is a showcase for the DCNS Gowind family of corvettes. One of the two crews still operates, while the second was stood down. The deal with Egypt, besides the Normandie, would include 24 Dassault Rafale fighter jets, and air-to-air Mica and surface-to-air Aster 15 missiles.